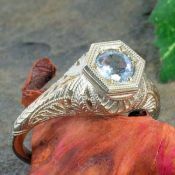 Antique, Edwardian and Art Deco style filigree rings in gold and platinum. Each item is marked with our estimated shipping time, please allow extra days for delivery and sizing if requested. All gemstones and diamonds are genuine, gem quality unless otherwise noted. A key to what the qualities stand for is noted on the 'Our product' page along with gemstone treatment disclosures. 33 Items. Showing Items 1 thru 15. Featuring a 6.5mm 1.00 carat aquamarine. Setting is made from the original mold circa. early 1900's. 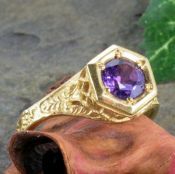 Featuring a 6.5mm 1.00 carat deep purple amethyst in a setting made from a mold of the original antique die circa. early 1900's. 5.0mm .50 natural blue spinel. Setting is made from a mold of the original die circa. early 1900's. 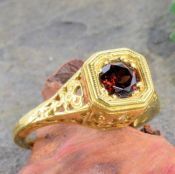 7.0mm 1.65 carat Mozambique garnet. Setting is made from the original die circa. early 1900's. 5.0x4.25mm .61ct oval shaped Mandarin orange garnet. Setting is made from the original mold circa. early 1900's. 8.0x6.0mm 1.6ct oval shaped sky blue topaz. Setting is made from the original mold circa. early 1900's. Featuring a 5.0mm .45 carat aquamarine. 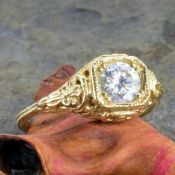 Setting is made from a mold of the original hand carved sie circa. early 1900's. Featuring a .63 carat Charles & Colvard created Moissanite set in a forget-me-not flower designed filigree. Setting is made from a mold of the original antique die circa. early 1900's.